This has been an exciting year for our organization as two major changes have taken place and we have crafted a strategic plan that will guide us through 2020. I’m Working! It’s Working! We have seen the result of nine years work as some of our oldest students finish their post-secondary education and get jobs. There is an article in the newsletter about our post-secondary program, describing how it will work and the results to date. We now have 94 students who have finished their primary and secondary education. All of our 2012 graduates are employed and more than half of our 2013 graduates. With each newsletter we will profile students who have completed their education and are now employed. Karibu Loo. We have completed the pilot for Karibu Loo and have placed an order that will put us on the path of growing this business. We have been very pleased with pilot results and believe the business has great potential to both provide income to support our education mission and also to provide employment for many of our graduates. We will begin to grow the business in 2016. 3. Return to growth – the board has endorsed the objective of growing to 1000 students actively supported plus alumni by 2020. As has happened in the past 9 years, there will be many changes and challenges in the coming years. However, with a clear strategy and the work of talented people, I feel optimistic we will be able to craft an enduring future for the organization. As always, sincere thanks for your support. We have placed an order that will begin expansion of the portable toilet business in Nairobi. In early 2016, we will fully launch the business by adding a pick-up truck, a VIP toilet and another 40 cabins, along with hand-washing stations in response to our key learnings during the 2015 pilot. During the pilot project we were able to break even because all of the capital was donated.. We are actively soliciting financial support to pay for the cost of the equipment that will allow us to expand. Those efforts will continue in 2016. If we are able to secure donations to cover our capital needs we will be able to begin making financial contributions to Ngong Road Children Association’s operating budget next year. In 2015, we exceeded our goals for employment of our graduates. To date, 24 graduates have worked as Associates at events, learning important employment skills. In addition we have hired three graduates to assist with operations, administration and accounting. As we grow these results should continue. Michael Switzer will continue as our volunteer general manager in Nairobi until June 2016. We expect to hire his successor in March and to continue to build the team and infrastructure that will allow this business to build on the successes of 2015. 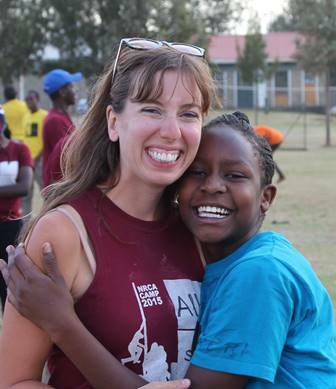 Friends of Ngong Road Camp Experience – Opportunities Abound! First, a big thank you to all of you who provided economic support for the 2015 Friends of Ngong Road Camp. As a result of your support Camp 2015 offered more opportunities, more experiences, more learning and more fun than ever before. 2016 will be another great experience! Read on to see how you can become a part of it. College Institute (NCI) of Tulane University in New Orleans. The mission of the Institute is to educate undergraduate women for leadership in the 21st century. Kenney, who sponsors three children with Friends of Ngong Road and has been to Kenya twice, was eager to engage her students globally and curious as to whether younger students in the developing world would find value in NCI’s gender and leadership model. In 2015, Kenney and NCI’s Senior Program Coordinator, Mailliron Hodge, taught leadership and gender sessions at Leadership Camp, Senior Camp, and Grammar Camp. They brought with them a wonderful film on Wangari Mathai. Both the boys and the girls enjoyed the activities and the lessons resonated. Kenney and Hodge were inundated with campers who wanted to know more about how to learn and enjoyed participating in all of the activities. Because Kenya is still on the State Department’s Watch List, we all anxiously awaited the outcome of request to approve a credit course at Tulane for 2016. Happily, Tulane approved. Twenty students are enrolled in the preparatory course, taught by Gwen Thompkins, former East African correspondent for NPR. Kenney and Hodge hope to bring at least five student volunteers to camp. We hope that Tulane students will broaden the camp curriculum, teach study skills, and mentor our students. Kenney reported that participating in camp was the most rewarding teaching experience of her life but was saddened to learn that at age 56, she can no longer really jump rope. 297 students and 32 volunteers (many were NRCA post-secondary students) attended camp this year. skills as they worked their way through the three day curriculum including teaching the principles of effective leadership. This interactive learning experience is focused upon a deepened understanding of good leadership characteristics, practicing leadership skills, understanding the responsibilities and tasks of being a camp counselor, and introducing the idea of using and working with emotional leadership. Grammar Camp 2015, attended by 112 campers, was held outside of Nairobi, at the St. Francis Xavier School as were Leadership and Senior camps. It was the first time we have held Grammar Camp in the rural area, and the kids loved the fresh air, and especially the boat ride on Lake Naivasha. They also enjoyed the many “crazy games” and relays at camp. However, the favorite activity in both Grammar and Senior Camp was the making of tie-dye T-shirts. This complicated art project was the brainchild of Margaret Pfeffer who attended her fifth campas Art Director. Her amazing talents resulted in over 300 camper-dyed T-shirts with nary a mishap! Seventeen of our youngest students attended Kids Camp this year. We conducted this one day excursion at a wonderful amusement park in Nairobi. The kids loved the games and the especially the rides! 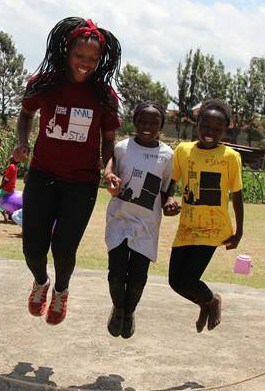 Friends of Ngong Road’s board of directors decided in 2008 that we aspire to “go deep” with the students we sponsor. This principle led to the decision to continue with students through post-secondary training despite the increased expense. Our aspiration is to provide assistance to these young adults until they are prepared to get jobs in Kenya’s growing economy. students finish high school, with the largest class being the class of 2015 with 38 students. We have learned a great deal as we have shaped this extension to our core program focused on primary and secondary education. 1. Formal acceptance: We require that students formally acknowledge they plan to join the post-secondary program and understand their responsibilities, including attending computer skills training, obtaining a national identification card and developing a proposal for their own post-secondary education by June of the year following graduation. 2. Support based on academic achievement: Most students will qualify for a one-two year program that focuses on job skills training. Only those who qualify for government scholarships will be given the opportunity to attend university, although exceptions may be granted from time to time. 3. Realistic expectations: We have tight guidelines about duration and cost of the courses and try to focus students on career paths likely to lead to jobs. As is true in the U.S., young people mature at different tempos though most experience a great deal of growth and development from ages 18 through 22. We have seen this in Kenya as our students move from unrealistic aspirations to reality-based plans. Assisting them with that process requires a great deal of time, wisdom and expertise. In 2014, we hired Joy Obiya as our post-secondary caseworker. Joy is the person who provides this coaching and guidance. Imagine if every year you needed to help up to 40 young people decide on their career path! Joy is courageous, honest and very effective at providing guidance while still leaving the primary responsibility with the young person. The class of 2012 includes four students who have finished their post-secondary education and all are employed in good jobs. 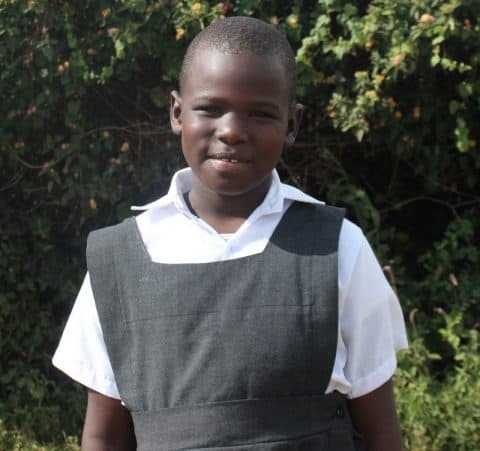 The fifth student, Marline Wanjiku, is enrolled in university and working part-time. The class of 2013 was 12 students, two of whom elected not to pursue post-secondary education. Of the remaining 10, two have finished their post-secondary program and are doing an internship. Six have part-time work and are going to school. The remaining two are in school full-time. The class of 2014 was 37 students. Most have either started their post-secondary course work or will do so in January. Two students from this class had babies in the intervening year and we are still sorting out our approach with these two students. Many of our students will complete their post-secondary course work in 2016 or 2017 and we will support their efforts to get jobs. It is especially exciting to begin to see the results of this program in lives transformed by work. To see more, please watch this short video: “I’m Working, It’s Working”. In August we had our annual camp. This is the time we concentrate on letter writing to the sponsors and also making sure that children learn about leadership skills, interactive games, hiking, among other things. Tom has always attended Camp every year since its inception and through his leadership skills we have always learnt a lot. This time we were able to work on Salesforce.com before camp started in order to make sure that it remains our managing tool for our work in Kenya. 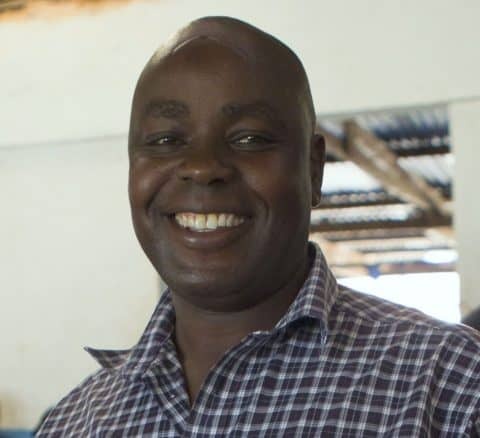 Some of the things that Tom helped on Salesforce are home visits reports, school visits reports and letters reports as well as making sure that it is a tool that we can use on the ground to manage the work better in future. This year we went hiking around Mt. Longonot as well as boat riding where children were able to see hippopotamus at Lake Naivasha. It was a wonderful time being with the children and we got to understand them even better. Karen and Susan who are U.S Board of directors visited us from 29th November to 5th December. Apart from bringing greetings from U.S we got to learn a lot. We covered a lot of mileage in post-secondary issues like making sure we are on track with the new graduates on how we will make sure that they get enrolled in colleges on time. We were also able to review the scholarship committee guidelines. Karen was also very involved with the library and she gave us very good ideas on fundraising which we will implement come year 2016. She worked a lot with our librarian, Norah, in making sure that the library is working and maintained for the benefit of the children. All in all I would like to give my gratitude for their visit. Every time we have a visitor from the U.S we feel blessed because we get to learn a lot. I am very happy to report that 24 students from our program are now benefitting with part time jobs from Karibu Loo. Apart from working for pay they also learn about timekeeping in employment, interaction with customers as they narrate their stories as well as being in a working environment. We are happy with Karibu Loo because all the income are to benefit NRCA in its mission. Every year we normally hold a local fundraiser (Harambee). This year it took place on 5th December and Karen and Susan were able to attend just before they left for U.S.A. We managed to get food donation of 744 packets of maize flour from Kimfay, a company in Kenya who have been very supportive of our program and 248 containers of shortening from Bimeda ( from our volunteer, Chris Adams) who are also strong supporters of our mission and 100 food packages from Braeburn School where Leah Switzer (wife of our Karibu Loo General Manager, MIchael Switzer) works. In total we managed to raise Ksh. 344,000 both in cash and in-kind donations.